UB’s Food Pantry Task Force is creating plans for an on-campus food pantry to help combate students’ food insecurities. Plans will be submitted in November and construction is planned for January. A new student and faculty group is developing plans for an on-campus food pantry to combat food insecurity. The UB Food Pantry Task Force, created by Vice President Scott Weber in August, plans to present administrators with options for an on-campus food pantry in November, with construction of the facility set to begin in January. A 2016 report from the National Student Campaign Against Hunger and Homelessness found that 48 percent of respondents reported food insecurity in the last 30 days [before taking the survey] and 22 percent had low enough levels of food security to qualify them as hungry. Task force chair Sherri Darrow said Weber created the group in response to SUNY-wide and campus input. In February, Sub-Board I, a non-profit corporation owned by the seven student governments, sent a proposal to Student Life to create a university-funded, on-campus food pantry. 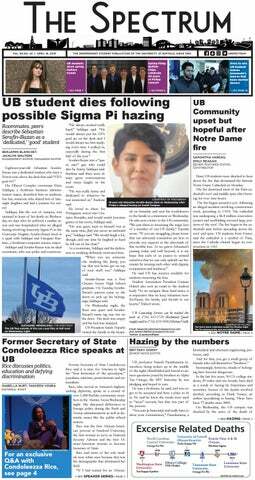 According to Darrow, director of Health Promotion, the 11-person group is charged with understanding the extent of students’ food insecurities on all three of UB’s campuses and making recommendations on the model, location and operations of a sustainable food pantry or pantries to meet students’ needs. Darrow said the cost of the pantry is unknown until a plan is finalized. She said the group is still working on options for funding its food solutions, including philanthropy and donations. The task force will follow recommendations developed through the SUNY Food Insecurity Task Force established by Gov. Andrew Cuomo in March as a part of his “No Student Goes Hungry Program.” The task force will also be informed by the current master plans being developed for the UB Student Unions and wellness center. Graduate Student Association President Jessica Coley said the issue of food insecurity goes hand-in-hand with UB’s low graduate student stipends. She isn’t on the task force, but said many graduate students have experienced food insecurity, so she’s happy that change is on the way. “It’s a step in the right direction because grad students –– and not just the ones that are TAs and GAs –– we’re already not paid a living stipend and we have to manage our money so that it lasts us throughout the times when we’re not in school,” Coley said. “Sometimes it’s harder for people to get jobs [while in school] so they have food insecurities and they’re not sure where their next meal is going to come from." But, she’s skeptical of the timeline. Task force member Jennifer Schechter, a graduate student in the linguistics department and SBI president, said many factors about the pantry are still unknown. The group is working on location, the kinds of foods it offers and hours of operation. Schechter said she hopes students, staff and faculty members will help build up the pantry by donating food to their fellow students. Whether it’s bringing in a bag of canned goods for extra credit or a Greek Life organization completing community service hours, she wants to see students helping others. Darrow said the task force’s immediate plans include providing free fruit as part of the “Snacking Tuesdays” event, which provides free snacks in Wellness Suite 114 in the Student Union, free and low cost farm share crops, cooking classes and group dinners. The group also met with the Presbytery of Western New York’s pantry coordinator to identify current procedures and future collaboration to extend services to UB students. The group met with small groups of students to ascertain student needs and to ascertain what would help support their ongoing access to food. The task force’s future initiatives include work with Blackstone LaunchPad to create innovative ways to meet students’ food needs and working with the assessment services office to run student focus groups. Students will have the opportunity to collaborate with faculty who conduct community food insecurity research and identify practices that could enhance a UB model for students' access to food.